Divorce can be a very traumatic, frustrating and confusing experience. 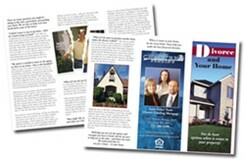 The Divorce and Your Home brochure, distributed by attorneys to their clients and featuring your photo, logo and contact information, helps people realize they may need help in making the right decision about what to do with their home and/or mortgage. And it lets them know where they can get that help. 8.5 x 11, full color tri-fold on 100lb gloss text. Customize It - Once you've placed your order, you'll upload or email your photo, logo, contact info and any designations you'd like to include. We'll send you a proof, normally within one business day. We don't print it until you say it's ready.